Authored by anemeth on Feb 6 2019, 9:58 PM. 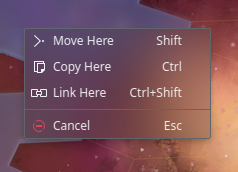 The drag and drop popup menu background was broken everywhere. anemeth added a reviewer: Frameworks. anemeth added a subscriber: ngraham. anemeth added a reviewer: kde-frameworks-devel. I will wait for someone from the frameworks team to review this before landing it. Sounds good. It's the same thing that's done in other places, so I don't expect there'll be any problem. Wait, do we need to add this workaround to every popup menu around? What about 3d-party apps? Can't we fix the actual bug in Qt/breeze/whatever instead? @anemeth can provide the details, but IIRC we did wind up concluding that we needed this workaround in various places. I believe this is a bug in Breeze, since this works with Kvantum themes without this. Definitely not an option. IMHO it makes no nsense to add these lines in every single Qt application. Exactly. Please fix breeze instead. The workaround isn't required everywhere, just in a small number of places. This is actually the last place that causes user-facing issues with blur that I'm aware of, and prior patches were accepted by Plasma developers, so it would be a shame not to land this last one. The workaround isn't required everywhere, just in a small number of places. It still is a workaround, and the fact that the places where this is "needed" are not many still does not justify it IMHO. prior patches were accepted by Plasma developers, so it would be a shame not to land this last one. The real shame was to accept such workarounds in other places, instead of fixing breeze (or qt). @pino, can you help fix us the root cause then? The reason why we've resorted to these workarounds is because nobody's been able to adequately understand the root cause or implement a risk-free fix. Ping. The workaround is known to work and cause no regressions, and I see no reason to torture our users with broken behavior for any longer. I would like to land this for Frameworks 5.56 if we aren't going to be able to work on fixing the root cause anytime soon. The workaround is still a bad workaround, and as such ought to not be in a general-purpose framework such as KIO. Sorry, I don't have the time to also dig into this issue myself; OTOH, this is not a reason for accepting such broken code. Also, please do not resort to psychological tricks like "torture our users", as if this is any worse than any behaviour issues there. Stilla big -1, sorry. You will need a KIO maintainer for their opinion on this "patch". In case it's (1), why was this behaviour even added in the first place? There is no psychological trick. This is simply how I see things: we are doing this for the users. Users are experiencing this bug. We have a known, working, low-risk (or even risk-free) patch that fixes the issue. The patch is a workaround rather than a true fix, but this is because nobody has so far figured out how to fix the issue itself without introducing substantially more risk. Given these conditions, I don't see the harm in landing the patch. Everything in life involves trade-offs, and to me, this patch falls into the category of "don't let the perfect be the enemy of the good." I heartily agree with you on the general principle of avoiding workarounds and fixing issues at their root causes. However so far nobody has been able to do so for this issue. On the other hand, we have a workaround that we already know works and does not cause regressions because we already uses it with success in other places. In this messy world we live in, sometimes workarounds are the lesser evil. The alternative is that this remains broken for users and we continue to get bug reports about it. If you don't have time to dig into this, do you by any chance know anyone who does? KIO is used not only by Plasma users, so it would be very bad to add workaround because of a specific workspace bit. As I mentioned, please fix breeze instead; if it cannot be fixed, then remove the behaviour that triggered these bugs (this PR and the other workarounds already accepted (sigh)). I still do not see how it is even a good idea to add code (in breeze) that produces bugs elsewhere, and force "elsewhere" to work around that. Again, fix breeze, pretty please. I already said something about this. "we added crap, so let's add even more" is not really a good arguments to use, IMHO.